Are you a fan of sea food, peanuts and milk? I take it you’re starting to drool excessively right about now. But what should you do when indulging in such foods turns into a real nightmare? Nowadays, we keep hearing about food sensitivity and food intolerance, also known as food allergies. Many of you probably fall into that category or know somebody who does. The question is, what triggers food allergies in the first place? An allergy is a hypersensitivity reaction by your immune system to harmless proteins found in food. What happens is that your body suddenly starts perceiving beneficial substances as harmful, and starts producing the so-called antibodies to prevent anything bad from happening. The previously mentioned sea food, nuts, dairy and wheat protein are your usual suspects. And the first organ that gets to experience an allergic reaction is your skin. This can be seen in the form of a rash and/or itching. Moreover, your respiratory system can be affe cted, as is the case with your digestive system with gas, bloating, and even diarrhea to serve as proof. Some allergic reactions can even be life threatening, and can lead to anaphylactic shock that takes over your whole body, and requires medical attention ASAP. 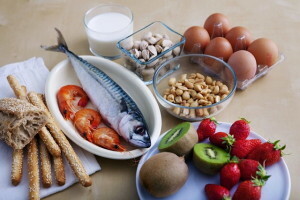 Luckily, today we have the means to diagnose food allergies with such precision you’ll know exactly which ingredients you need to ban from your kitchen. And after you’ve found the culprits, the only thing left to do is say your goodbyes. What to pay attention to when dining out? Do you know what are mudras?